Veterinarian Kate Turner said she’d fill in for Doc Anderson for a year because she thought working in the small town of Oak Falls, New York would be relaxing. Battle-scarred from a relationship gone wrong, Kate needs a change of pace to regroup and heal. But on one of her house calls, she discovers an elderly couple dead and their dogs running loose. The police decide that the deaths are a result of a murder-suicide, but Kate isn’t so sure. The Langthornes would never leave their beloved show dogs without proper care, no matter what other problems they faced. The issue bothers Kate, and she can’t help but snoop. Her questions stir up trouble, and Kate quickly learns that small towns and dog shows are much more complicated than she first thought. This is a delightful debut cozy mystery. Kate is no-nonsense and likeable as she deals with the lively residents of Oak Falls, both the humans and the animals. This book starts out with Kate rescuing a hamster from a vacuum cleaner, and the whole scene was adorable. I love animals, and I very much enjoyed the veterinary aspects of the story. 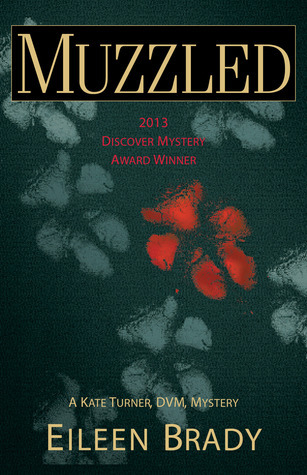 “Muzzled” is a compelling start to what I hope will be an ongoing series.